One of my dearest friends is arriving from California today to visit for a couple of days. While I have prepared an itinerary filled with fun activities that I know she’ll enjoy, one of the most important things I’ve done in anticipation for her arrival (or that of any guest) is preparing the guest room. 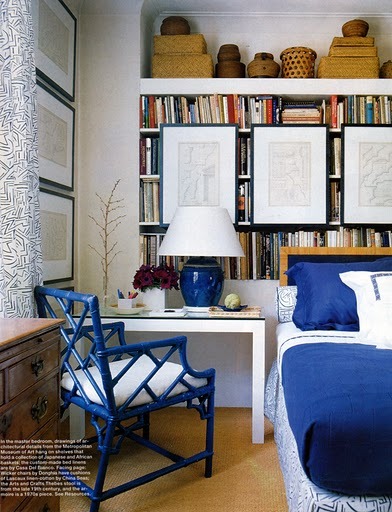 A guest room should be comfortable and should be a welcoming expression for your guest. An air mattress or your old comforter from college simply won’t cut it! You should put thought and effort into the space where your guest will be spending their visit. For example, I recently purchased a new embroidered duvet cover and made sure that all of the linens were pressed and crisp. I also made sure to include bottled water, fresh flowers, and a travel alarm clock. To add a few more personal touches, I wrote a handwritten note welcoming my friend and included both national and local Houston magazines, so that she can get a better feel for what is going on around town. I’ve included some beautiful examples of guest rooms, but what I really want to know is: what do you do to make your guests feel especially welcome when they come to visit for a few days? I try to leave extra pillows, blankets and towels handy. No one wants to feel like a bother by asking for those late at night or early in the morning. And I make sure the bathroom they'll be using is fully stocked with toiletries, plenty of supplies and things like Aspirin and other basics. It's all about anticipating needs. An extra new toothbrush is handy too. I may a point to spruce up our guest bedroom even if it's already neat and clean (i.e., I fluff the pillows once more, lay out towels, and add a few flowers to the nightstand). My guest bedroom is still a work in progress, but I try to make a point for everyone to have a comfy space to retire to when they are visiting. Great post, especially as we all prep for the holidays! Love that first picture! I make sure to fill the refridgerator with food and make sure the guest bathroom is fully equiped. Also make sure that the guest room smells pretty and the linen is washed right before they arrive. Some great ideas! I think the best things you can do is make sure they're fully stocked with what they may need (ie: towels, etc.) and also make them feel at home. Nothing worse than a guest who feels like they have to tip toe around. It sounds like you have prepared your guest room really well. I like the idea of having a bottle of water and some magazines or books to read.I also put a throw on the end of the bed to make sure they are warm enough. Then I put their towels in the room so they know where to find them. Another good idea is to put a little tray or bowl bedside the bed for their jewlery.I have lost my jewlery a few times staying with friends. I also find a place for them to put their things. That way they don't feel like they have to live out of a suitcase. hope you have a great time with your friend.Sounds like you have some great things planed. the blue is absolutely stunning! I love that unique headboard in the last pic. All of this is necessary + a little TV in the bedroom. It is very difficult to houseguest unless the hostess has done all the "hotel stuff" for your room. I really try to leave a small footprint when I'm visiting anyone, and so appreciate having these niceties. Ironing sheets is absolutely the best! I would be thrilled to be a guest in any of these rooms! I'm with Connie - I think the most important thing about having a guest is making them feel that your house is their house while they are there - there's nothing worse than having them feel that they're in the way! Lovely post and a great reminder of how to roll out the red carpet for guests! I always leave a little basket of toiletries and snacks for my guests and provide several different pillows to choose from. There is nothing better as a guest then knowing your host really made an effort to prepare for your stay! Water on the bedside table and a super comfortable mattress!! I think you are right, nice post. I love entertaining weekend guests and do all I can to make their stay as comfortable as possible. In the guestroom: I put out fresh flowers and a plate stacked with chocolates on the nightstand and make sure the clock is set and there's a convenient plug for cellphone and other electronics. I stack a set of bath linens attractively on the bed, along with small bottles of basic toiletries, a house key and a handwritten welcome note (I have a small run of "house stationery" for this purpose). In the kitchen: I stock the refrigerator with an assortment of juices and a few snacks. Next to the coffee maker is a quick instruction sheet on how to use the cup-at-a-time coffeemaker, coffee packets and a selection of muffins. I love that horse print. does any one know who the artist is or where it can be gotten?